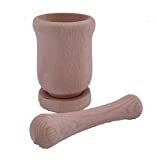 Beautiful little beech wood pestle & mortar. Use it for gently grinding fresh herbs and spices, or for crushing sea salt or peppercorns. Small, but mighty – as effective as a large, stone pestle & mortar, but without breaking the wrists! Measures 10cm high x 6cm diameter. Made in Germany from sustainable, well-managed forests. Not recommended for the dishwasher, but will survive it OK. Rub a little olive oil in now and then to keep it in tip-top condition. Part of the Nutley’s natural wood kitchen ware range.